The infographic “Cheat Sheet for Overcoming Public Speaking Fear” explains the causes of public speaking fear and how to overcome it using two key steps. 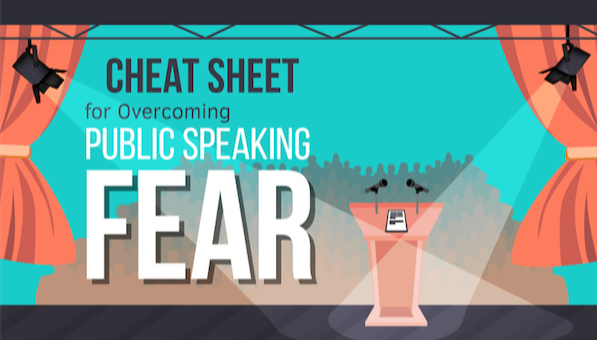 Dr. Cheryl Mathews has released the infographic: Cheat Sheet for Overcoming Public Speaking Fear at http://bit.ly/1rKIgeb. The infographic shows how the nervous system can get stuck in a self-perpetuating cycle of fear and what to do. It also explains that there are two stages of fear: First-fear (uncontrollable) and second-fear (controllable). First-fear feeds into second-fear and causes escalation and panic. The infographic shows how to manage the process and keep fear to a manageable level. The infographic outlines two key steps to overcome public speaking fear and phobia: Learning fear management techniques and practicing the techniques in a safe environment. Dr. Mathews developed a public speaking phobia program that follows the two steps. It starts with a self-paced video course. The course uses animations and interactive exercises to explain how fear works and how to manage it. The second step in the program is a safe “laboratory” where participants learn how to apply the fear management techniques that they learned in the course. Participants work at their own pace in a small group and are coached by Dr. Mathews. The program is based on cognitive-behavioral techniques (CBT). It meets in Woodbridge, Virginia (Washington DC metro area) or from any location using video conferencing. The infographic “Cheat Sheet for Overcoming Public Speaking Fear” explains the causes of public speaking fear and how to overcome it using two key steps. To view the infographic, visit www.speakmeister.com/edu/public-speaking-fear-cheat-sheet. For more information about the Public Speaking Fear and Phobia Program, visit www.speakmeister.com/edu. Dr. Cheryl Mathews has a doctoral degree in Psychology and is a board certified coach. She founded the Public Speaking Fear and Phobia Program in 2012. She also founded SpeakMeister, a video practice platform for communication skills training. For more information visit www.speakmeister.com/edu and www.speakmeister.com.